The staff at Cinema Romantico is a little uneasy about this “Top Gun” sequel, much like, say, any Rolling Stones devotee might be a little uneasy about a “Satisfaction” sequel in which Mick and Keith have, in fact, achieved satisfaction and are now explaining to some hapless young lad – think James Corden – about how he too can acquire satisfaction. Ew. But if this sequel had to be, which it did because it’s Hollywood, well then the least they could do was include Val Kilmer. 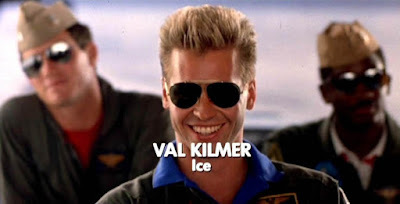 How could you have a “Top Gun 2” without Tom “Iceman” Kazansky? He, not Maverick, won the damn Top Gun trophy! What, are you gonna have a reunion for the 1968 American Winter Olympic Team and not invite Peggy Fleming? So that’s why even if we are not wholly quelled over the forthcoming “Top Gun 2”, we are at least pleased in the face of our powerlessness to stop its existence that those in charge have finally, long after “Top Gun 2’s” production was first reported, seen fit to, yes, per The Wrap, include Val Kilmer in the predestined boondoggle. The Kansas City Barbecue owner. That was the rollicking joint, of course, where Goose sang “Great Balls of Fire” and Maverick and Charlie re-connected at the conclusion over the jukebox. And rather than become a Top Gun instructor, Iceman bought the place, installing himself as a less tragic heir to Bryan Brown in “Cocktail.” Iceman’s Law: the only thing better than buzzing the tower are the burnt ends. Top Chef. In this era of Reality TV it would only make sense to bring the Top Gun competition to television, perhaps to SPIKE since it was recently renovated into the Paramount Network and “Top Gun” is a Paramount production. A dozen hotshot pilots compete over 12 weeks to hoist the Top Gun trophy and after each hop the pilots repair to the judge’s flight deck to see which pilot is told to turn his/her flight helmet and aviator sunglasses. Maverick is Tom Colicchio. Charlie is Padma Lakshmi. And, of course, Iceman is Gail Simmons, because Gail Simmons should be on every episode, dammit, and for some reason known only to the oracles of idiocy isn’t. Olympic volleyball team coach. After winning the Top Gun Trophy and helping to save the free world (even though the other side denied the incident), Tom Kazansky is seeking a profession a little less casual if nevertheless still rife with competition. So Kazansky, on the strength of his beach volleyballing bonafides, takes a job as head coach of the Los Alamos Canyon Creek Community College Men’s Volleyball team, gradually working his way up the ranks before assuming command of the U.S. Men’s Olympic Volleyball Team. But with an Olympics in the Pacific Rim looming, the Russians have developed a MiG-Galaxy S9+ they are threatening to unleash on the unsuspecting host country. Maverick is there to stop the threat, but he needs a little help, a little help from an old friend. Thus, Coach Kazansky must decide whether he will take up his whistle for the Gold Medal match or return to the cockpit one last time. Apocalypse Now. Iceman has gone off the grid and, in advance of a big Pacific Rim summit, taken with him crucial Naval Intelligence. Maverick is summoned by the aging Viper to go up the California coastline and to Big Sur to find Iceman and re-acquire said intelligence. Eventually, Maverick finds Kazansky hiding out at the Esalen Institute where the erstwhile pilot has taken up residence as a transcendental meditation instructor. His mantra, Iceman explains, is the Naval Intelligence, and no meditator is allowed to reveal his mantra. As such, Maverick must enter Iceman’s world to uncover the information, only to get, as is traditional, more than he bargained for. Iceman + "Apocalypse Now" sortof already happened (AND I LOVED IT), toward the end of "The Island of Dr. Moreau." I'm thinking of the scene where Val seems to be plopped into Prince's 1991 VMA performance of "Gett Off." Perfection. I am up for any of your above ideas. I truly hope they haven't made him an evil senator, sitting on some military appropriations committee or whatever.